So MI has re-launched the Tides module with some subtle changes / updates, the biggest change are the 4 outputs. Anyone have any hands on experience with the new one, or potentially BOTH versions to comment on it? From just reading descriptions and watching a couple Youtube videos - I am having trouble understanding what is possible with the 4 outputs now that was not possible before. Its also hard to tell if the expanded output capability really just applies when using it as a sound source, or also when used as a modulation source. 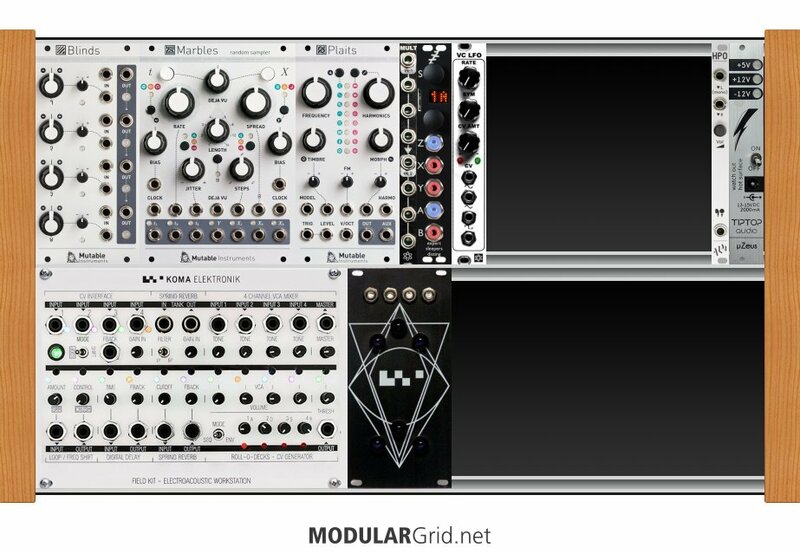 I was considering adding a Tides to my small but growing rack for super slow, evolving type modulation, but now I am torn on if I should hold out for a new one or buy the original used for $100 less. I have two of the original Tides, and now a 2018 Tides I received as a gift in my system. Personally, I love the original Tides and still use them constantly. The new Tides has a lot of useful tricks up its sleeves that I haven't entirely explored yet, like being able to take four identical LFO's at different phases, or pan the same LFO across four different outputs, or clocking envelopes at four different speeds. The chords mode, is really pretty if you have a four channel mixer to mix it all down. I'd suggest that if you're working with a small rack (or a rack that will stay small for a while), you may want to save up for the newer model. Don't get me wrong, the original Tides was maybe the third module I ever bought, and it was extremely useful even without all the bells and whistles that the new Tides has, but Tides 2018 will buy you some really cool functionality that you would need other modules for, especially when it comes to attenuating CV to the three waveshape inputs - that was my biggest frustration with the original Tides, and one of the reasons I had to buy an additional mixer/attenuation module. Thank you! That helps. Yes, its a fairly small rack so I like the idea of being able to use the Tides to modulate multiple things simultaneously and sounds like the new version is more capable of that. The chords mode seemed to be what people focused on since that's completely new, but not as likely for me to use. There is an 8HP version of the original module, which may be a tougher call vs the new module. Anyone have recommendations for Envelope Generators / VCA's / Mixers to pair with Tides 2018 for its audio mode? I'm super interested in the module for its multiple uses. The modulation source seems like a no brainer. It seems like to get the most out of the 4 audio outs, you need some serious utilities. I've browsed around a bit using "quad" in the search, but I'm a little lost. Seems like you'd need envelopes AND a vca's to really get moving. It seems like another Tides 2018 for envelopes and a MI Veils would be solid pals... anything else? This is part of why the 2018 Tides is a little more useful in a smaller system - the addition of attenuverters and the extension of the level control to cover a few different functions helps cut out some other modules for certain tasks. For example, in it's audio mode, the level control can act as a pseudo-vca (like the original, but it only affects the bipolar output). You'll still need a mixer and a VCA for things like chords mode, or gating CV's. As for mixing multiple outputs, in the default audio mode, you git a bipolar, unipolar, pulse, and sub output. Generally, I find myself only using two of those, maybe three (I rarely use audio output as an audio signal on its own - but it's really useful as the modulation frequency for AM). I've found Tides to be extremely compatible with pretty much anything. If you're starting out, and you don't want to expand too quickly, Maths acts as a great source of modulation and mixing, though you'll probably still want a simple VCA to play around with as well. And if you're getting a second oscillator at some point, checkout something like Blinds - the sine output of Tides is fantastic for ring modulation, and that ability to invert the phase of a modulation source is useful in some circumstances. Thanks for your thoughts. The level control thing was particularly helpful. I had seen the functionality playing with it in VCV rack (I was very excited to see it released just recently in the preview build), but hadn't made the connection to using it in audio mode. I've been stuck on the excitement of chords mode and just like "wait, where do I send all these voices". This is (roughly) my current setup (KOMA units are both stand alone modules IRL) At first I'd thought I jumped the gun on Blinds, but it has proven invaluable really for shaping CV, I was glad to see it as a recommend. Anywho, thanks again for weighing in.